Unified theories are general frameworks that attempt to identify links between previous distinct patterns. They are desirable not only on the principle of parsimony, but also for their ability that allows multiple predictions to be made with a minimal number of inputs. In the past decade or so, several unified theories of biodiversity have emerged that rely on various mechanisms yet predict a similar set of macroecological patterns (McGill 2010). We examined these theories from the following three aspects. Some of the unified theories are so newly fledged that a comprehensive evaluation is still wanted. Among these is the Maximum Entropy Theory of Ecology (METE). METE adopts the Maximum Entropy Principle from information theory, and identifies the most likely (least biased) state of an ecological system assuming that it is constrained by a few state variables. METE’s ability to unite patterns of biodiversity with patterns of energy consumption and body size makes the theory one of the more parsimonious and powerful unified theories. We (Daniel McGlinn, Ethan White and I) conducted a strong test of an early model of METE (ASNE; Harte 2010) where we simultaneously evaluated all four of the model’s major predictions with data from 60 globally distributed communities. 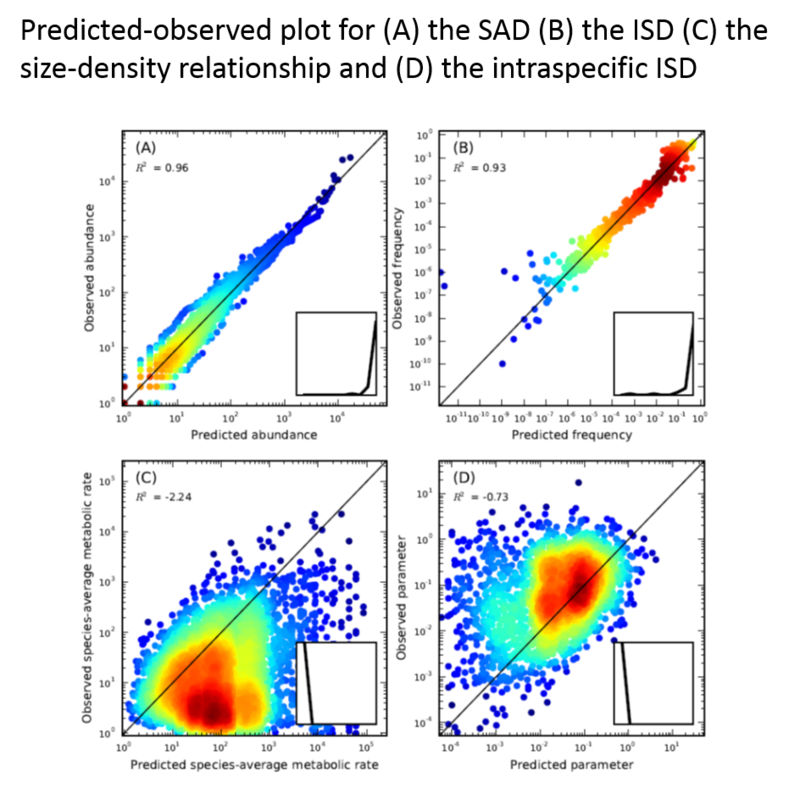 We found that the model in its current state is able to successfully capture the distribution of individuals among species (species abundance distribution or SAD) as well as the distribution of body size among individuals (individual size distribution or ISD). However, it fails to uncover the empirical relationship between species abundance and body size, calling for further development and modification. This work is published in the American Naturalist (DOI: 10.1086/679576). Unified theories allow for stronger comparison between alternative theoretical frameworks. While a single pattern can often be equally well described by various theories make very similar or even identical predictions, it is much less likely to be the case when multiple predictions are involved. In a followup study, we (James O’Dwyer, Ethan White and I) compared the size-specific neutral theory (SSNT; O’Dwyer et al. 2009) with METE, using two models from each theory. While METE focuses on the most likely state of the system given the constraints, SSNT is constructed with ecological processes of birth, death, and growth. Thus the comparison gave us an opportunity to explore if the constraints were sufficient, or if the processes contained additional information that would contribute to shaping the structure of the communities. As in our previous study, we found that the METE models were capable to characterize the SAD and the ISD. The SSNT models also worked equally well for these two patterns. In addition, they made more realistic predictions about how individuals of different sizes were distributed among species, though a large proportion of variation remained explained. While METE and SSNT are big steps forward as simple, tractable unified frameworks, we still have a long way to go to figure out the appropriate configurations of these theories and when they apply. This work is currently in press in Ecology. Having multiple theories built upon drastically different assumptions yet making more or less similar predictions is unsettling. It strong implies that the current unified theories may be merely manifestations of the true underlying mechanisms from which the patterns arise. McGill (2010) suggests that there are three “minimally sufficient rules” shared by all current unified theories – intraspecific aggregation, interspecific independence, and an uneven global abundance distribution. While this is a big step forward towards establishing the causal link between patterns and mechanisms, several questions remain to be answered – what is the most parsimonious mathematical framework to combine these three rules, without invoking additional mechanisms or processes? Are they strictly necessary, or are mild perturbations allowed? How well do they hold up in reality against empirical observations? I hope to address some of these questions in my future research.